Not to be confused with the similarly named ‘Jar of Hearts’ purveyor Christina Perri, Christina Parie, the Aussie X Factor pop sensation is ready to set the record straight on a few things. The regular confusion with her Warner Music label mate being the first subject we cross off the list. “The confusion works the other way now,” she laughs. “‘Cause usually they get me confused with her. Now you get her confused with me!”. The Sydney teen will no doubt be untangling more mix ups of the sort now that she’s doing promo and interviews to herald the arrival of her debut EP: ‘16 & Unstoppable’. Christina is the latest contestant from the 2011 Australian ‘X Factor’ series to step into the spotlight with her own music, following close behind former competitors Reece Mastin and Johnny Ruffo, both of whom scored ARIA top 20 hits with their respective singles. When asked if there was a sense of rivalry still lurking after the show, Christina shuts it down, revealing it was never there to begin with. “During the show, we all had each others’ backs,” she reveals. “We all wanted to help each other because we knew we were all so different. There was not another Christina Parie that I was trying to be, there was not another Reece Mastin Reece was trying to be, and there was not another Johnny that Johnny was trying to top. “We were so in our own skin and we knew who we were, so we were working artist to artist,” she says, affirming that they still talk and catch up when they run into each other at events. It’s been a year since Christina first auditioned for ‘X Factor’, beating hundreds and thousands of hopefuls to be the last girl standing in the competition. Under her mentor Mel B’s guidance, Christina powered through the live shows to finish sixth, but she emerged from the experience hungrier to drive her own success. “I learned that no matter what your circumstance, you can’t rely on people to do stuff for you,” she says. “You’ve just got to drive it yourself. Completely self-motivated, the young star wasted no time after the show. She set off to write and put together her EP at the start of the year – even before signing a record deal. During the process, Christina knew Warner Music “had their eye on her” and after she wrapped up work on ‘16 & Unstoppable’, she presented the five-track EP to them. “It was like an audition,” she says in a matter-of-fact way that shows no hint of entitlement. And just like the one she kick arsed in on the Channel 7 talent show, Christina came out victorious. ‘16 & Unstoppable’ is a feisty collection of pop rock with punk influences recalling early Avril Lavigne and The Veronicas, who contributed the stand out track ‘Back to Life’. Even though Christina is aware of her status as a pop star, she wasn’t about to compromise the kind of artist she had always wanted to be: a rock star. She unleashed her inner rebel and punk princess ballsiness in the music video for ’16 & Unstoppable’ – and caused a stir with its depiction of teenagers running amok, stealing and vandalising. “When I made the video, I wasn’t thinking about what would please mothers – I was thinking what does ‘16 and unstoppable’ mean,” Christina says, evidently aware in hindsight how some actions depicted were taken too seriously and out of context. “It’s basically me showing my rock side in a pop song. Rock is rebellion, and I come from a rock/punk background. To be chucked into this pop world, I still wanted to keep that spirit,” she explains. “I swear, the day we did the video, that was like the most illegal thing I’ve done in my whole life,” she gushes, with a hint of adrenalin still running. After the title track, there will be no more single releases from the ‘16 & Unstoppable’ EP. Instead, Christina will now concentrate on getting the next single ready and her first album together in time for a planned September release. She got an offer to write with Simple Plan after supporting them on tour and she’s hoping to also work with We Are The Kings. “I am writing with absolutely everybody!” she says. “With the first EP, I just worked with people I knew, but now with the help of a label, who knows who they can set me up with! I’d love to do something with a rapper, mash different genres, and do something different.” she says. Are we talking about a hip hop and punk blend like the time Jay-Z and Linkin Park did their mash up album? 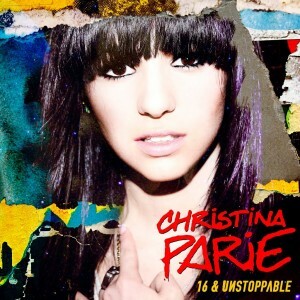 Christina Parie’s ’16 & Unstoppable’ single is available digitally now. The ’16 & Unstoppable’ EP is also available – both digitally and physically. Christina’s debut album is due later in the year.